Depression is itself a mental illness; but sometimes it can conceal a deeper medical issue. Channel News Asia recently reported on some cases in which depression was actually a symptom of underlying health problems. 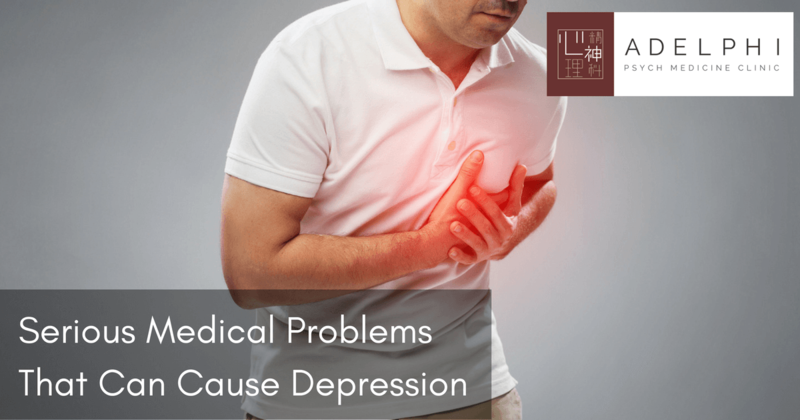 Find out what medical issues can masquerade as depression until a doctor or psychiatrist in Singapore realises the true cause. The thyroid manufactures hormones that help the body regulate its metabolism, heart function, digestion, muscle control, and brain function. If the thyroid is malfunctioning, creating too much or not enough vital hormones, the body and brain suffer. Symptoms like irritability, depression, restlessness, nervousness, or fatigue can appear. The patient may lose or gain weight. All these signs may be attributed to clinical depression, when in reality they indicate the malfunction of the thyroid. When the heart is struggling to keep up or is missing beats, the blood flows more slowly or erratically, and oxygen doesn’t always reach the cells as it should. This can cause lethargy, confusion, or “brain fog.” It can also cause a panicky feeling that is easily mistaken for anxiety. Cancer patients often go to their doctor when they feel something “off,” or something wrong. They may be tired and listless. They may experience weight changes and behavioural changes, as well as insomnia, pain, and shortness of breath. While these signs may be interpreted as depression-related, they can also be early symptoms of cancer. Look for additional indications of cancer like skin changes, pain, or a persistent cough. The symptoms of lung cancer, thyroid cancer, or pancreatic cancer can be particularly difficult to notice until the condition has progressed. Depression can mask other issues as well; in fact, the Psychiatric Times listed about 47 medical problems that can have depression as a symptom. Besides those, there are also medications whose side effects can include depression or anxiety. For example, patients who think they are suffering from anxiety may experience symptoms like a rapid heartbeat, breathing problems, or chest pains, when in reality they could have asthma, pulmonary embolism, or sleep apnea. The reverse can also be true; patients who think they are having a heart attack might be suffering from a panic disorder instead. Someone with irritable bowel syndrome could have an anxiety disorder that causes a chain reaction of digestive issues. Connecting the medical field of study with the psychiatric field is vital if doctors are to understand the whole picture of a patient’s health and make an accurate diagnosis. If you feel that you are suffering from depression, seek the help of a psychiatrist or a psychologist in Singapore. Getting help right away is essential, because the earlier someone can evaluate your mental and physical health, the sooner you can have an accurate diagnosis. A trained Singapore psychiatrist, like those at Adelphi Psych Medicine Clinic, can usually conduct various tests to see if your depression is a true clinical case, or if it is being caused by an underlying physical problem.